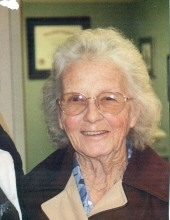 Frances Lucille Crouse, age 85, of the Baptist Valley section of Cedar Bluff, VA passed away Sunday, March 17, 2019 at her home. She was a 1950 graduate of Richlands High School. She was a member of New Hope Assembly, an UMWA Associate Member, Associate Member of VA Sheriff Institute and a RSVP Member. She was born July 15, 1933 in Red Ash, VA and was the daughter of the late Billy Whitt and Lula Davidson Whitt. In addition to her parents, she was preceded in death by her husband, Donald W. Crouse; one sister, Dee Cordle; and daughter-in-law, Karla Crouse. Those left to cherish her memory include one daughter, Karen Davis and husband David of Baptist Valley, VA; one son, Larry Crouse of Baptist Valley, VA; adopted son of the heart, Malcom Browning; two sisters, Doris Messick and husband Glen of Covington, Ga and Margaret Hicks of Oxford, Ga; one brother, Daniel Whitt and wife Carolyn of Richlands, VA; 7 grandchildren and 5 great-grandchildren; several nieces and nephews also survive. Special thanks to Helping Hands Hospice and Community Home Health Care. A very special thank you to caregivers, Kathy Whitt, Theresa Mosley, and Kenyan Jackson. The family will receive friends after 12 noon Wednesday, March 20, 2019 at Singleton Funeral Service in Cedar Bluff, VA.
Funeral Services will be conducted at 2 p.m. Wednesday, March 20, 2019 at the Singleton Funeral Service Chapel with and Rev. Rick Whitt and Sister Helen Throgmartin officiating. Burial will follow in the Crouse Family Cemetery in Cedar Bluff, VA. Pallbearers will be family and friends. Honorary Pallbearers will be members of New Hope Assembly. The family of Frances Lucille Crouse is in the care of Singleton Funeral Service in Cedar Bluff, VA.
To send flowers or a remembrance gift to the family of Frances L. Crouse, please visit our Tribute Store. "Email Address" would like to share the life celebration of Frances L. Crouse. Click on the "link" to go to share a favorite memory or leave a condolence message for the family.